You can write by hand on your Windows 8 tablet anywhere that Windows accepts typing. You can handwrite a letter in Microsoft Word, for example, or write in the name of a newly created folder. 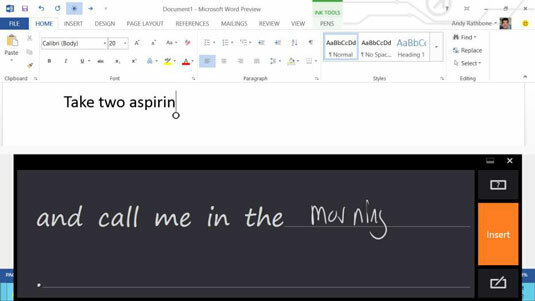 As you write, Windows converts your handwriting to words and drops them into the appropriate place. Tap where you’d like to enter text. Tap any place that accepts text — an e-mail, a Word document, an entry in a calendar — even the name of a new file you’re saving. If the handwriting panel doesn’t appear, tap the taskbar’s Keyboard icon. If a keyboard appears instead of the handwriting panel, tap the Switch Keyboard icon and choose the Stylus option. Begin writing in the handwriting panel, either in cursive, block letters, or even a combination. As you write, Windows quickly begins recognizing the separate words, listing them in order along the panel’s left edge. After you’ve written a short phrase, tap the Insert button. Windows inserts the words as text. If all goes according to plan, you’ll write your words, insert them, and move on. If all doesn’t go according to plan, you’ll need to correct your mistakes.